Gathering of information related to our topic is a major problem in this regard. The Study did not capture all the wings of the economical sector due to limited time and information. Due to poor data management, the real picture of governance failure could not be included. authenticity of the information provided by them is not absolutely above the question. This is about the Bangladesh economic situation and its problem. Here information shows the obstacles that hampering the growth of Bangladesh economy. In this report, there are also some prediction that at 2050 where we want see Bangladesh economically and other sector of development. GDP of current year, previous years and also a prediction of 2050 are also including here. So there are opportunities to know about Bangladesh economic condition and vision for 2050. Bangladesh has achieved remarkable progress in the areas of primary schooling, girls’ education, immunization, micro-credit, female economic participation, birth control, physical mobility and safety nets. The most remarkable achievement is in the field of primary education with the country well on its way to meet the development goal of universal primary education by 2015. The challenge here is ensuring adequate finances to keep up the momentum and ensuring quality education for all. Although all relevant indicators of development goals have moved towards Bangladesh 2015 targets, its performances have been uneven. To understand this variation, it is important to analyze the reasons of the slowing down of the child mortality rate, the apparent plateauing of total fertility rate, the rise in youth unemployment rate, and most important of all what factors work in accelerating the pace of poverty reduction. It is important because the main underlying factor for the slow pace of development goal achievement is poverty. Poverty permeates all sectors and holds back growth in every sense. To address this issue, Bangladesh is in the process of completing its first PRSP, which has taken into account the development goals. The PRSP is addressing the issues of pro-poor growth and human development, and when implemented, will accelerate the achievement of the goal. For this to happen successfully there is need for strong partnership at the global and at the national level. For countries like Bangladesh to meet the MDG commitments made at the 2000 Millennium Summit, industrialized countries must honor their commitments to finance development in developing countries. Trade barriers must be lifted and both the rich and the poor must be allowed to benefit from globalization so that we can all move towards a more equal world. The broader objective is to review the governance system of the economy sector and to identify the economic situation and set a vision likely to be present in the different divisions of the economy. 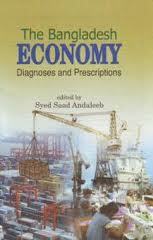 To identify the existing problems and governance failure have caused to severe problem in economy. To identify the vulnerable areas of problems and risks as at policy level, procurement, generation, transmission, distribution of resources of economy. To identify the factors responsible for poor HRM, accountability and transparency of resource distribution. To identify the reasons for non-technical loss and estimate economic loss. Principal rivers: Padma, Meghna, Jamuna, Brahmaputra, Teesta, Surma and Karnaphuli. (total 310 rivers including tributaries). Principal industries: Ready made garments, pharmaceuticals, cements, garment accessories, chemicals, fertilizers, newsprint, leather and leather goods, paper, sugar, jute, ship building. Principal exports: Readymade garments, frozen foods (shrimps), leather, leather products, jute, jute products, tea, ceramic, textile fabrics, home textile, chemical product, light engineering products including bi-cycle. Location: Between 200 34′ and 260 38′ north latitude and between 880 01’and 920 41′ east longitude. Area: 56,977 sq. miles or 147,570 sq. km. Principal seasonal crops and fruits: Paddy, jute, wheat, tobacco, pulses, oil seeds, spices, vegetables, jack-fruit, banana, mango, coconut, pineapple etc. Natural resources: Natural gas, coal, lime, white clay, granite, glass sand. The economy of Bangladesh is primarily dependent on agriculture. About 84% of the total population lives in rural areas and are directly or indirectly engaged in a wide range of agricultural activities. Agriculture contributes about 20.29% to the country’s GDP- 23%. About 43.6% of the labor force is employed in agriculture with about 57% being employed in the crop sector. The abundance of natural resources available in Bangladesh supports a range of highly profitable investment opportunities in agribusiness. Over 90 varieties of vegetable are grown in Bangladesh, yet in this fertile land there is under utilisation of the country’s agricultural capacity. This presents many opportunities for investors seeking to export agricultural products, or to meet the rapidly growing local demand. Huge supply of raw materials exists for the agribusiness industry. A tropical climate for all year growing, a lot of fresh water, indeed a land interspersed with numerous rivers, available land with fertile soil. Government and NGOs conduct regular training programs to develop skilled manpower in the industry. Wide range of biodiversity exists for different crops. Agricultural commodities have a comparatively higher value added than non-agricultural commodities. Cold storage facilities serving the supply chain, especially fresh produce for export. Fresh produce production for local and export markets. Production of fertilizers and cultivation of seeds. Eco-friendly jute production, supported by jute technology development institutes. High value-added foods for export, including herbs, spices, nuts and pulses. Bangladesh has the essential attributes for successful agri-based industries namely rich alluvial soil, a year-round frost-free environment, available water and an abundance of cheap labor. Increased cultivation of vegetables, spices and tropical fruits now grown in Bangladesh could supply raw materials to local agribusiness industries for both domestic and export markets. Progressive agricultural practices, improved marketing techniques and modern processing facilities have raised the quality of agribusiness and expanded production levels significantly. The Equity Entrepreneurship Fund for development of agribusiness industry. Special loan facilities available to set up an agribusiness. Agribusiness industry enjoys tax holidays. Any investment in this sector will enjoy similar tax amnesty as available in other sectors. Imposition of supplementary duty on mango, orange, grape, apples, dates and others to utilize the high quality and cheaper local resources. Cash incentives to the exporters ranges from 15% to 20% in various sub sectors. The global ceramics industry is worth in excess of $10bn. Bangladesh is perfectly positioned to expand rapidly in this sector with its high quality: cost ratios and creative human resource base. Technical expertise and skilled manpower in tableware and other ceramics. Clean gas reserves in certain locations to fire kilns for competitive cost advantage. Bangladesh ceramic tableware has a good reputation in the international markets like North America and EU countries. Sanitaryware and insulators have a strong domestic demand as well as international market demand. The global ceramic tableware industry is currently going through a phase of acquisition and consolidation as smaller firms in the developed countries are becoming uncompetitive and bankrupt. As a result, the big names like Noritake, Wedgewood, Lenox, Villeroy & Boch and Royal Doulton are all individually becoming billion-dollar operations. Traditionally, the tableware industry is labor-intensive and companies in developed countries experience difficulties in remaining competitive. Bangladesh, being a gas-rich and low-labor-cost economy, is perfectly positioned to be a strategic partner in production and supply of ceramic products. Investment interests in this sector are strongly welcome. A few ceramic tableware manufacturers dominate the industry producing high quality products for the international brands. A pool of skilled manpower has been developed. The latest technological advancements in ceramics are also being utilised. Bangladesh produces high quality bone china, transferring the technology from Japan. The high skill, low cost labor resource of the electronics sector in Bangladesh offers companies great returns on investment. Whilst the global market for semiconductors is worth in excess of $200bn and is dominated by the Asian economies, Bangladesh has significant financial and economic factors in its favor that make it the best choice for many companies. Manufacturing of semiconductors could be established as a standalone industry. Bangladesh is going to be one of the largest cell-phone markets in South Asia. The home appliance market in Bangladesh is growing rapidly. The labor-intensive nature of the electronic industry matches the ability of Bangladesh to provide a high skilled labor source. The electronics industry in Bangladesh mostly produces consumer items. Home appliances includes televisions, radios, DVDs and CD players, refrigerators, air conditioners, ovens, electronic fans, blenders etc. are being assembled to a large extent. To ensure the performance reliability, the key challenges in this sector are technical assistance and proper technology orientation of the industry. Developing the significant capacity and skill in assembly and manufacture of a wide range of electronic components and parts is crucial. As yet, Bangladesh does not have any telecommunication equipment industry in the private sector. However, an urgent need for diversification and modernization is felt among the existing entrepreneurs, government and professionals. The government is keen to provide and ensure enabling assistance to the development of this sector. From spinning to weaving, from knitwear to leisurewear and high street fashions, the textiles and clothing industry is Bangladesh’s biggest export earner with value of over $ 16 bn of exports in 2009-10. Our factories design and produce for the world’s leading brands and retailers. This rapidly growing sector of the Bangladeshi economy offers a unique competitive edge that supports profitable expansion into new strategic markets. Cost and quality of products that are produced on time, reliably and very competitively with a highly skilled labor force. A unique regional location for expansion into key Eastern and other markets. Favored trading status with the EU and the USA. Clusters of companies providing a local supplier base with real depth in skilled labor, training and technical development facilities. Bilateral agreements with 28 countries and Generalised System of Preferences (GSP) of the EU are key reasons for Bangladesh RMG products having access to global markets. The current cycle of GSP applied from 1 January 2009 to 31 December 2011. Bangladesh is now a significant RMG supplier to North America and Europe. Bangladesh has also taken a better position in the USA market through competition. Bangladesh is expected to maintain its tariff-free access to EU under the European GSP, since the GSP is not covered by the Uruguay Round Agreement. Recently Canada has also provided tariff-free access for all the items from Bangladesh. Meantime, the Bangladesh RMG industry has become very competitive as a global standard RMG source. Marketing investments have been made in trading partner economies; end users can often differentiate products with confidence. Enormous investment opportunities exist in this sector. In the RMG industry demand for fabric significantly exceeds local supply and so is currently being met by imports. Backward linkage is a significant trading opportunity and is supported by a government backed incentive: 15% cash subsidy of the fabric cost to exporters sourcing fabrics locally. The most beneficial public policy of introducing back to back LC* and bonded warehouse facilities provide a tremendous impetus to the export scenario in Bangladesh. ICT and business services in Bangladesh are a vibrant sector supported by an enthusiastic culture and a government committed to providing a pro-business climate for all investors. Over 400 IT companies are now thriving in the country supplying to local and international markets worldwide. Industry ranges from inbound call centers to the latest in Web 2.0 software development. Widespread use of English makes Bangladesh a fast, emerging option for the global business services industry. Vibrant cluster of international companies exporting worldwide. Highly skilled, cost effective workforce with a strong work ethic. Ideal geographical location to meet needs of key markets. Direct investment in proprietary ICT and business/financial services. Outsourcing of ICT and business services to existing established Bangladesh businesses. Development of telecoms infrastructure and services. Opportunities exist for companies that invest their futures with Bangladesh based on a number of key factors. ICT cluster: over 400 well established companies, 150+ exporting worldwide of which two thirds export to North America. Managerial skills: high graduate output with excellent IT and linguistic skills, over 90% fluent in English at managerial level. Workforce: highly skilled, cost-effective, strong work ethic. Infrastructure: connected to the high speed international submarine cable network, established IT and e-commerce service. sector – ensuring reduced set-up time and costs, excellent transport links to key markets and suppliers. Supportive fiscal and non-fiscal environment; incentives to ease start-up costs, competitive tax regime, low utility and energy costs. Liberal FDI regime: no prior approval requirements or limits on equity participation or on the repatriation of profits and income. Geographical location: excellent market access and location between the key markets of India and China, and ASEAN* countries. BOI Business support: maximum fast-track help and co-operation from all relevant authorities through BOI-experienced professional advisers to welcome and support incoming businesses. With tens of thousands of young IT skilled workforce conversant in English, Bangladesh is one of Asia’s most attractive IT outsourcing destinations in South Asia, particularly for clients in the USA and other Anglophone countries. Bangladesh offers significant cost advantages for IT outsourcing , both in terms of labor and infrastructure costs. Salary of programmers in Bangladesh is 40% of that in India, 50% of Philippines and 70% of Vietnam. Charges for Internet bandwidth in Bangladesh are currently the lowest in South Asia (50% of that in India). Rent for office space in Dhaka (capital) is below 20% of that in Delhi and 40% of Manila. Over 15,000 IT engineers are working in more than 400 software and IT service companies. Around 150 of these companies are specialized in servicing overseas clients. Abundant, low cost labor – ideal for labor intensive industry. Good quality domestic supply of raw materials, as by-products of large livestock industry. Government support in the form of tax holidays, duty free imports of raw materials and machinery for export-oriented leather market, export incentives. Tariff and quota free access to major markets such as the EU. The pharmaceutical sector in Bangladesh has developed fast. Originally set up to cater for local needs as a manufacturer of patent medicines, the industry now exports drugs to highly regulated markets. Expansive international companies have established operations in the country as they seek to grow, promote exports, drive down manufacturing costs, and undertake research and development into reverse engineering of patented medicines. Highly skilled work force and internationally competitive cost base, with high quality management resources fluent in English. Ideal regulatory and tariff environment. Excellent geographical location close to emergent economic giants of China and India. Quality tertiary education producing a plentiful supply of top flight scientific talent. OVER the last few decades, Bangladesh has been following a development path that was blazed by the fast growing Asian economies with export led growth fuelling higher living standards and falling poverty. Despite this, it is not too difficult to posit that Bangladesh today has more in common with the laggards in Asia. Slow growth, rising inequality, and a deprived countryside deny the vast majority of the Bangladeshi people the opportunity to enjoy happier, healthier, and more prosperous lives. For moving forward, Bangladesh needs to identify the opportunities and the key weaknesses that the country faces and adopt appropriate measures. There are many ways of doing this analysis. One popular method is to list the Strengths, Weaknesses, Opportunities, and Threats (SWOT) facing the economy and society at large. Although the SWOT analysis is more often applied to evaluate the competitive position of a company this can also be applied to a country. In particular, SWOT analysis is forward looking; it is less for the past than for the future. The exercise identifies areas that need attention or might emerge as problem areas in future. There may be success in some areas. But does that mean we should continue to do the same or shift gears and put more emphasis on other issues? The main purpose of conducting a SWOT is to get a sense of the relevant issues of taking strategic decisions– of priorities, of possibilities, and of dangers. This is important to begin a thoughtful discussion; a serious conversation about the priorities that we should focus on. In terms of strengths, there is no doubt Bangladesh is in a good geographic location. It provides an important link between the economies of South Asia and the dynamic Southeast Asian region. Bangladesh sits on strategic trade lanes and Chittagong can emerge as a major port to service the regional economies. Although Bangladesh is a new nation, it represents an old and flexible civilisation. Both its ecology and history point to the people’s hidden resilience in the face of adversities, with capacity to produce unexpected social renewals and economic recovery. Another source of its strength is the rapid advance made by the non governmental organizations (NGOs) and other grassroots bodies, creating alternative delivery mechanisms and acting as vocal civic institutions especially for the poor. This is an important source of ‘social entrepreneurialism’ and a channel of vibrant development of many elements in society. The ongoing process of mainstreaming women into development is a strategic strength to bring wider and deeper social and economic changes. Gains in increasing political and electoral participation of women, enhancing press freedom, and creating a vibrant civil society are important for strengthening democratic institutions and consolidating human rights. The country’s vulnerability to natural disasters has significantly declined that used to inhibit greater investment flow and reduce its productivity and return in the past. Several important structural changes have taken place, such as agriculture becoming more resilient with the spread of dry season irrigated crop production and rapid expansion of non-crop agriculture; non-agricultural sectors assuming greater importance; infrastructure and market developments contributing to greater spatial integration and lower price effect of exogenous shocks; and higher mitigation capacity in responding to natural disasters. Bangladesh has a fairly good and expanding stock of both physical and human capital, and with favorable policies, the upgrading potential of both capital is bright. The remittances from overseas workers have already become a great source of strength and this can be increased manifold with right policies. Relative stability of the country’s economic fundamentals has created a fairly good macroeconomic environment. As one can see, all the above elements represent significant strengths of the Bangladesh economy. One uncomfortable feature is that Bangladesh is one of the few countries where income poverty is falling slowly even though economic growth has picked up. Even after three decades, most of the economic sectors (especially agriculture) are still weak; health and education indicators are low. Infrastructure, while improving, is still poor especially in electricity, having a per capita use which is among the lowest in the world. The economic and administrative cost of securing business is high as well. A feature of both a weakness and a threat is the rapidly rising inequality in income and wealth, which neither supports economic efficiency nor social equity. This is socially destabilizing as underemployed urban masses and a swelling rural landless people are much more volatile than a well-rooted community of employed non-farm workers and landed farmers. The absolute size of the population, despite success in lowering the growth rate, is increasing fast that creates tremendous pressure on resources as well as on provision of essential services. If agricultural productivity is low, investments in irrigation, improved agricultural systems, markets, and infrastructure can raise production and productivity. If foreign direct investment (FDI) is low, then improvements in governance, infrastructure, and investment climate can attract more investments. A higher demand for skilled workers can create an incentive for better training and education. Services sector development including export of skilled manpower is a real possibility. There is a promising private sector and the dynamism of this sector, especially in information communication technology (ICT), can be an important opportunity. In the past, Bangladesh achieved a slow progress in poverty reduction. In the future, improper management of development may accentuate poverty and inequality leading to social instability. The threat is that governance would become worse and economic decisions would further concentrate wealth, fund capital flight, and increase social tensions. The efficiency in use of resources, and a political strategy for stability, equity, and growth is of greater priority in the coming years than it is now. Several other developments also threaten to undermine the socio-political stability and future economic progress, such as the challenge to ensuring good governance and stable law and order situation, reducing corruption and ensuring political stability, and adverse global developments including terrorism and sharp increase in commodity prices in the global market. The loss or reduction in garment exports is one such possibility. Building up a real competitive advantage by lowering port and other transport costs and informal charges and bringing in more efficiency in garments production is the best and only response. Similarly, any development that adversely affects the healthy growth of remittances will create a serious threat to economic and social progress. The failure to enhance the supply of quality education and good health is likely to create another threat. For the majority with poor education, the prospects for earning a decent income to move and stay out of poverty are not good. For them, indeed jobs will remain insecure and low paying. To help the growing number of young workers find decent jobs, to increase competitiveness, and to improve poverty situation, finding a way to improve critical services, including quality education and health services, is necessary. steady, stable growth performance of Bangladesh over years amid repeated episodes of natural calamities and external shocks has provided markets and entrepreneurs a predictable policy environment of low uncertainty. Following a couple of years in global crisis related mild slowdown, economic activities have rebounded in fiscal year (FY) 11 with strong (above 40 per cent) growth in both exports and imports. Provisional Bangladesh Bureau of Statistics (BBS) estimate reports 6.7 per cent real GDP growth for FY 11 (July 10-June11), following 5.7 and 6.1 per cent respectively of FY 09 & FY 10. The severe power supply shortages impeding output activities eased significantly in FY 11, enabling utilization of idle installed capacities. Benign climate and timely support measures yielded good growth in agricultural output. Given the palpable pace in growth momentum, the final estimate for FY 11 real GDP growth may touch 7.0 per cent; and the growth rate is projected to rise to 8.0 per cent per annum (pa) by FY 15. Growth path of per capita gross national income or GNI (estimated at USD 818 for FY 11) is on course to reach the middle income country group threshold (USD 996) by FY 15 or earlier. Bangladesh has consistently pursued a cautious, prudent stance in monetary and fiscal policies, with fiscal deficits below four per cent of gross domestic product (GDP) in recent years. The government’s modest revenue base (in GDP percentage) is widening steadily with ongoing reforms in revenue administration; rising to 12.1 in FY 11 from 11.5 of FY 10.The country’s medium term macroeconomic framework targets this to reach 14.6 per cent by FY15. In the post-crisis surge, exports to new markets in fast growing Asian economies and exports of newer items like marine vessels and information technology (IT) enabled services are gaining momentum. Domestic demand also remains robust, with spiking rural real wages signaling tightness of rural labour markets. Extensive self-employment lending by microfinance institutions and small & medium enterprise (SME) financing flows promoted by financial inclusion campaign of Bangladesh Bank (BB) are visibly transforming economic life in rural regions. Near self-sufficiency in food grain output (domestic rice production meets 96 per cent of local needs) cushions the economy against stresses from global shortages and price spikes. According to World Bank (WB) and WTO rankings, Bangladesh in 2010 had 21st position in GDP growth rate, 7th position in remittance receipt, 70th and 68th positions respectively in export and import volume. Growth potential of Bangladesh has earned recognition in several global surveys; like ‘one of the frontier five markets’ (JP Morgan Chase), ‘in next 11 emerging markets after Brazil, Russia, India and China or BRICS’ (Goldman Sachs), ‘ 7th among top 10 global online outsourcing destinations’ (Christian Science Monitor). Social and human development indicators of Bangladesh are also improving steadily. The percentage of total population living in poverty (upper poverty line, 2122 kilocalorie or kcal daily food intake) has declined from 57 of late nineteen nineties to 31.5 in 2009; and Bangladesh is on course for attaining most of the Millennium Development Goals (MDGs) by or before 2015. Recently Bangladesh received UN award for impressive progress in reducing infant mortality, and for being among top ten performers in gender equality, already attaining it in primary school enrolment. Domestic monetary policies of small economies like Bangladesh have limited leverage on domestic inflation; much depends on trends of prices of imports from global markets, which are influenced by spillover effects of domestic macroeconomic policies of larger economies. Bangladesh Bank (BB) remains proactive in using the monetary policy tools at hand to limit demand pressures in domestic markets from excessive monetary growth. Cash reserve requirement for banks were enhanced in both FY 10 and FY 11, and BB’s policy interest rates (repo, reverse repo) were enhanced thrice in FY 11. The rather sudden sharp acceleration in investment and output activities in FY 11 following a spell in relative slowdown placed the domestic financial markets under substantial liquidity strain; and BB had to engage substantially with the markets on a day to day basis; injecting Taka and USD liquidity to meet part of the growing demand while allowing interest rate hike and exchange rate depreciation to curb the remainder. As the central bank of a developing country, Bangladesh Bank uses its monetary and credit policy tools in an integrated way, seeking to maintain optimal balance in growth-inflation tradeoff. Positive outcome of this approach has shown up in GDP growth gain, with core (non-food) inflation remaining at lower single digits. Domestic prices of food and fuel commodities (which happen to be large components of headline CPI inflation) follow trends of their import prices (Bangladesh government subsidizes user prices of fuels, and some agricultural inputs to cushion shocks from uptrends in global prices; this is already a big fiscal burden). We expect the current round of policy measures in larger economies (viz., monetary tightening in China and India, fiscal austerity in Europe, end of quantitative easing in US) to have some cooling off effect on global commodity prices, helping bring CPI inflation in Bangladesh down to single digit levels by the second half of 2011 [Half One (H1) FY 12]. The FY 12 national budget projects annual average CPI inflation easing down to 7.5 per cent, from the current level above 8.5 per cent. It would be relevant here to recall some pretty straightforward global disciplines that could keep global commodity price volatility and global inflation in check but are being overlooked or avoided under influence of big vested interests. Firstly, the prevailing volatility in futures prices in global commodity markets have far more to do with speculation by quarters that are neither producers, processors or users than with supposed price discovery by actual producers, users and other bonafide stakeholders in the supply chains. It is a shame to see speculation fuelled price volatility in essential commodities enriching speculators at the expense of impoverishing the consumers or the governments subsidizing their consumption. Bangladesh’s Perspective Plan for period up to FY 20 envisages transition from the low income country group to the middle income group by 2020, in terms of GNI per capita. Beyond this, we are looking forward to crossing the upper middle income country group threshold by 2030, on course to maturity by 2050 as a prosperous advanced economy and one of the leading growth drivers in Asia. A recent Citigroup global report sees Bangladesh sustaining an annual average 7.5 per cent real growth rate through decades up to 2050, enabled inter alia by her favorable demographics. This projection of growth pace is consistent with our own longer term vision for Bangladesh in 2050; and beckons the country as a very promising investment destination for both local and foreign entrepreneurs with global aspirations. The major objectives of planned development have been increased national income, rural development, self-sufficiency in food, and increased industrial production. However, progress in achieving development goals has been slow. Political turmoil and untamed natural hazards of cyclone and flooding have combined with external economic shocks to persistently derail economic plans. Bangladesh’s first five-year plan (1973–78) aimed to increase economic growth by 5.5% annually, but actual growth averaged only 4% per year. A special two-year plan (1978–80), stressing rural development, also fell short of its projected growth target, as did the second five-year plan (1980–85), which targeted 7.2% annual growth. The third five-year plan (1985–90) had a5.4% annual growth target though only 3.8% was actually achieved. In 1991, with the reinstitution of elected government, a new economic program was initiated that included financial sector reform and liberalization measures to encourage investment, government revenue improvement efforts (realized largely through implementation of a value-added-tax), and tight monetary policy. Income transfer measures, Food-for-Work, and other programs were also implemented to help protect the poorest segments of the population from the transitional effects of structural reform. Political turmoil from 1994 to 1996 helped reduce the final average annual growth rate under the Fourth Five Year Plan (1990–1995) to 4.15% (short of the 5% target), albeit the best performance so far under an economic plan. The 1996 elections brought renewed economic stability. Exports grew 14% 1996, and GDP growth for 1996/97 rose to 5.5% as the economy rebounded. Floods during 1998 and 1999 caused some economic slowdown but this was balanced by unprecedented growth in gas production and electricity production sectors. Average annual GDP growth under the Fourth Five-Year Plan rose to 5.3%. Fiscal year 2000 was marked by a sharp increase in monetary expansion due to unprecedented borrowing from the banking sector (though the sale of treasury bills) to cover budget shortfalls due. Domestic borrowing increased primarily due to the reduced availability of external concessional financing. Historically, Bangladesh has received foreign aid disbursements equivalent to about 6% of GDP, have lately declined to amount equaling 3–4% GDP. Moreover, according to the IMF, much of the domestic borrowing was being used to cover recurrent expenses such as wage and salary increases. The revenue to GDP ratio rose in 2001 from 8.5% to 9.4%, but this improvement was more than offset by expenditure to GDP ratios of 14.4% and 14.1%, creating budget deficits amounting to 5.9% and 5%, in 2000 and 2001 respectively. The drain on foreign reserves from domestic borrowing contributed to reducing the foreign exchange cover for imports to imprudent levels of two months in 2000 and one-anda-half months in 2001. The concern for policy and action planning guideline for human resources development in Bangladesh stems from the recognition that the economic progress of the past several decades, notable as it has been, has not led to the eradication of widespread poverty in the country. This is due, in part, to the limited attention paid to human resources as a crucial means as well as the ultimate end of development. We can consider the following issues in guiding policies and planning for human resources development: (a) sequential and long-term approach; (b) assessment of the efficacy of formal and non-formal approaches; (c) strengthening of political and administrative infrastructure for promoting and supporting popular participation; and (d) ensuring adequate levels of resources. The principal resources of Bangladesh are the fertile soils of the delta region, the long growing season, and the heavy rainfall suitably distributed over the year for growing rice and jute. The nation’s abundant water supplies are used to produce hydroelectric power and for irrigating farmlands during the dry season. Although minerals have traditionally been economically unimportant, the country has large reserves of natural gas and some petroleum deposits. Natural gas is piped into Dhaka and CHITTAGONG for industrial use. There are also large deposits of low-grade coal, mined at Jamalpur. I must add that Bangladesh’s natural resource is huge in terms of low-cost artisans, sea-farers and empowered women with tailoring skills. Her rieverine and coaster fish and sea food resourcebase is very substantial. All these including the fertile soil is as yet untapped/ underutilized in terms of potential production and more imoportantly productivity growth due to lack of adequate investments, inadequate opening up to foreign investments, land reforms besides political instability, terroism and corruption. Industrial undertaking” means an industry, establishment or other undertaking engaged in the production or processing of any goods, or in the development and extraction of such mineral resources or products, or in the providing of such services, as may be specified in this behalf by the Government. The socio-economic setting necessary for successful implementation of Science and Technology (S&T) policies in a developing country has been discussed and the concept of “technology culture” introduced. It is posited that the absence of technology culture in a given socio-economic setting makes implementation of S&T policies problematic. Technological resource base in Bangladesh and the low S&T achievement indices for the country, as worked out by some international organizations, are also presented. In discussing the status of existing R&D institutions it has been stated that, with the notable exception of agricultural research, there is absence of organized and well-planned research management systems in several areas. It is argued that even though individuals, national organizations and institutions continue to make commitments to development of S&T, the relative strength of such commitments vary significantly. It is difficult to define the level of development as there is a continuum from more to less developed and so they are relative concepts. Number of doctors per 1000 people. The most common measure of development is the Human Development Index (HDI). Data from country to country may not be comparable. There may be variations within a country making the average unreliable. The results are very dependent on what indicators are used & their relative importance. Does not take into account the cost of living. Fails to pick up the social & environmental impacts of development. This is instead a measure of the output of goods & services produced in that country which may not necessarily all belong to that country. The difference between GNP & GDP is likely to increase as a result of the rise in foreign owned companies & TNCs. Relates the average earnings to the ability to buy goods. PPP therefore raises the GNP for developing countries & lowers it for developed countries. However it still doesn’t take into account regional variations or the social & environmental costs of development.